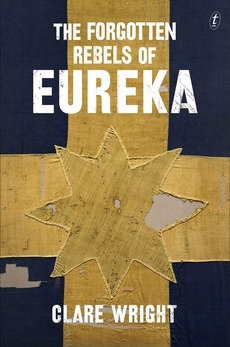 “The Forgotten Rebels of Eureka” by Clare Wright is being launched at the prestigious Museum of Australian Democracy at Eureka (M.A.D.E) on Saturday 26 October, 11am – 1.00pm. The Eureka Stockade. The story is one of Australia’s foundation legends, but until now it has been told as though only half the participants were there. What if the hot-tempered, free-wheeling gold miners we learnt about in school were actually husbands and fathers, brothers and sons? And what if there were women and children inside the Eureka Stockade, defending their rights while defending themselves against a barrage of bullets? As Clare Wright reveals, there were thousands of women on the goldfields and many of them were active in pivotal roles. The stories of how they arrived there, why they came and how they sustained themselves make for fascinating reading in their own right. But it is in the rebellion itself that the unbiddable women of Ballarat come into their own. Groundbreaking, absorbing, crucially important—The Forgotten Rebels of Eureka is the uncut story of the day the Australian people found their voice.